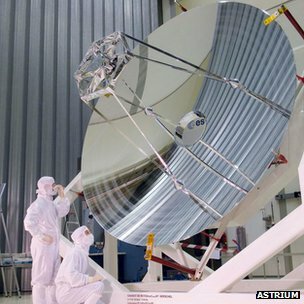 The European Space Agency (Esa) is about to lose the use of one of its flagship satellites. Since 2009, the billion-euro Herschel telescope has been unravelling the complexities of star birth and galaxy evolution. But its instruments employ special detectors that need to be chilled to fantastically low temperatures. The helium refrigerant that does this job will run out in a few weeks and when it does, Herschel will go blind. The coming demise of the telescope is no surprise. It is occurring just as was forecast at the start of the mission, almost to the month. Researchers are now busy running through a final list of observations, acquiring as many images as they can in the time left available. Already, thousands of pictures have been deposited in the Herschel archive, which is set to become a key reference source for decades into the future. 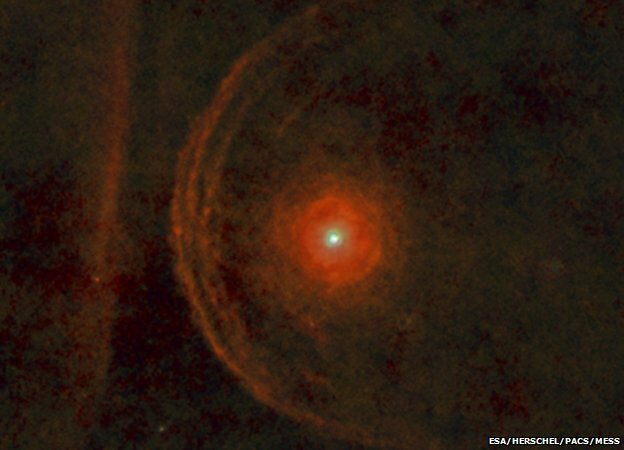 "I think there is a consensus in the community that Herschel has been a tremendous success and that we have made beautiful observations," Esa project scientist Dr Göran Pilbratt told BBC News. The telescope was launched almost four years ago and sent to an observing position 1.5 million km from Earth. It was equipped with a 3.5m mirror - the largest monolithic mirror ever flown - and three state-of-the-art instruments sensitive to long wavelengths of light, in the far-infrared and sub-millimetre range (55 to 672 microns). This technology has allowed Herschel to study the processes at play as large clouds of gas and dust collapse to form new stars. Its deep vision has also enabled scientists to trace the story of how galaxies have changed through cosmic time. 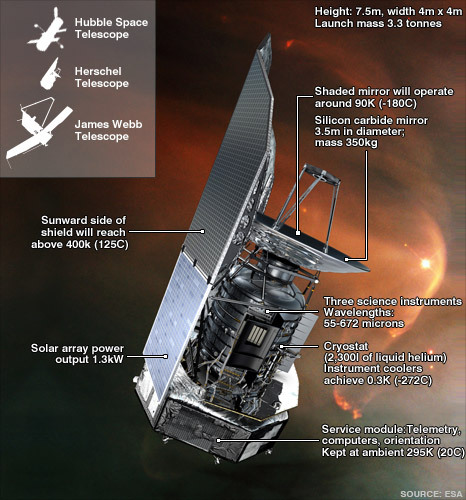 But the design of the instruments, and in particular of their detectors, has required Herschel be operated close to absolute zero (-273.15C). This has been achieved with the aid of a cooling system run on superfluid helium, more than 2,000 litres of which were loaded into the telescope at launch. The cryogen has gradually boiled off during the course of the mission, and the latest calculation from engineers is that it will be gone entirely sometime in the final two weeks of this month. Once the detectors start to warm from their ultra-frigid state, they will stop working. The end, when it happens, will be quite sudden. Those astronomers in the queue to use Herschel at that moment will no doubt be disappointed, but also philosophical: observing time was allocated on the basis that the opportunity could not be guaranteed as the mission moved into its end phase. Some engineering tests will be conducted on the telescope in April. The Esa operations team will then put the satellite into a slow drift around the Sun before ceasing all communications. Prof Matt Griffin, from Cardiff University, is team leader on the Spire instrument, which is sensitive to some of the longest wavelengths. He said the telescope had exceeded all expectations. "It will be a sad day when it makes its last observation, but the data that it has collected during its lifetime will keep astronomers busy for years," he told BBC News. "For the next three years, the Spire team will work hard to put all Spire data into the best possible condition to be as easy as possible to access and to use in the future. "Amongst Herschel's most exciting results have been the detection of many thousands of distant star-forming galaxies that are helping us understand how galaxies formed and evolved over cosmic time, and the mapping out in our own galaxy of the filaments and cores that are the sites of new suns being formed today."